Fungi : what are mushrooms? All living organisms on this planet belong to one of five kingdoms. Mushrooms belong to the Kingdom Fungi. Fungi include organisms such as moulds and yeasts. Fungi cannot photosynthesise, i.e. use light energy to produce food, therefore they need to obtain material for growth by some other means. Fungi are saprotrophic organisms (recyclers) that break down dead organic material to obtain nutrients. Although today we think of mushrooms mainly as a food product, they actually play a very important role in nature. Mushrooms are part of the primary recyclers in nature, secreting enzymes in order to digest the organic material. Primary decomposers usually decay woody material such as logs and tree stumps, which is often why you can find a colourful array of mushrooms in these areas. Furthermore, most of the mushrooms in woody areas are the fruit bodies of fungi that are mycorrhizal (symbiotic or mutualistic) on the roots of the woodland plants and trees. Fig. 1. Main tissues of a mushroom. 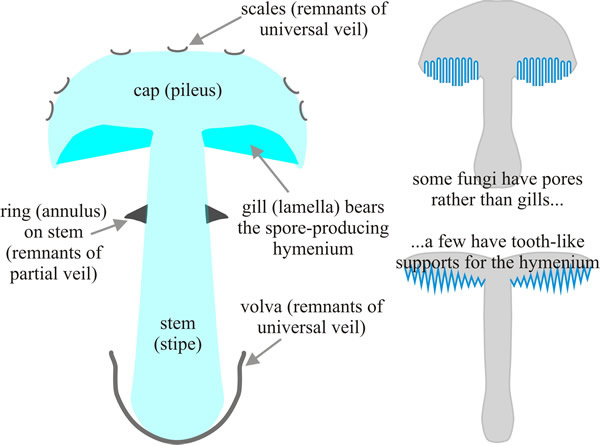 The mushroom is our main example, it is a spore-dispersal organ that is basically umbrella-shaped, with the spore-bearing hymenium lining the under surface of a cap (also called pileus) and supported above the substratum by the stem (stipe), shown in this diagrammatic vertical section. The mature mushroom may also bear remnants of thin tissues (veils) that protect the juvenile stages. From reference . All the tissues of the mushroom is actually made up of a network of fine strands called hyphae. The network builds up producing large fruit bodies, which we call mushrooms (Fig. 1). They grow to different sizes and structures and have different metabolic activities. There is thought to be well over 1.5 million different species of fungi , though only about 98,000 fungal species have been described to date . About 32,000 of these are basidiomycetes (relatives of the mushrooms), 12,000 of which can be classified as mushrooms of which about 2,000 are edible. Mushrooms cultivation is a huge commercial business (Table 1). World production of mushrooms is dominated by the Chinese who produce 64% of the total production. Not only is China the major producer but it is also the major consumer of edible and medicinal mushrooms. Because of the large demand of medicinal mushrooms it is expected that China will be at the forefront of developing new technology and methods for mushroom cultivation. *The species distribution is approximately 46% Agaricus bisporus (button mushroom), 26% Pleurotus spp. (oyster mushrooms), 15% Lentinula edodes (shiitake), 13% Auricularia spp. (wood-ear). Geographical distribution (as of 1997) was approximately 74% farmed in Asia, 16% in Europe, 7% in North America, and less than 1% in the rest of the world. Data from Chang, 2008 [reference 4]. The mushroom industries of the world all depend on some form of solid-state fermentation; but there are two traditional cultivation methods. In the European tradition the mushroom crop is cultivated on composted plant litter. Similar approaches were developed for oyster and paddy straw mushroom cultivation in the Orient, largely by peasant farmers; whilst in the Japanese and Chinese traditions the typical approach is to use wood logs to cultivate the crop of choice (Lentinula, called shiitake in Japanese, or shiangu or xiangu in Chinese). The European mushroom industry is said to have originated in the caves beneath Paris at the end of the nineteenth century. It probably emerged from the food-provisioning functions of the kitchen gardens on the estates of the European aristocracy, perhaps as early as the seventeenth century. Some of the surviving records of such estates refer to manured and composted plots set aside for mushroom production. The compost used, and its preparation, would very definitely be familiar to competent gardeners of those days. The current industry depends on compost which is very selective for the crop species Agaricus bisporus. Although widely distributed in nature, this fungus is rarely noticed because established mycelia produce a few isolated mushrooms very infrequently. Today’s industry is the result of a joint evolution during which otherwise ordinary horticultural compost was developed which achieves high cropping densities by an otherwise unremarkable and not very abundant mushroom. How were they used in history? Mushrooms have always been used throughout history as a flavoursome and nutritional food, various civilizations have learned by trial and error which mushrooms are edible and which are to be avoided. They are used all over the world since they are considered to be a good source of protein, fibre and vitamins, all essential for the growth, development and maintenance of health in humans. However in the Far East both edible and non-edible mushrooms have been used for medicinal purposes for several thousand years. They were often rare species obtained from forests. They were not usually used whole but used as concentrates, liquors or dried powders in health tonics, teas and soups. Today many of the rare species of mushrooms are commercially cultivated on a large scale . Every organ in the human body is made up of millions of individual cells that are able to balance the rate of cell death along with the rate of cell production. Sometimes a stimulus may occur causing the organ to produce more cells. Hence the rate of cell production is greater than the rate of cell death, this is called hypertrophy. However rate of cell production can be greater than rate of cell death without any external stimulation, this is what causes cancer. The cells continue to reproduce, disrupting the normal function of the organ, and if left long enough, can become life-threatening . metastasise, i.e. they are capable of spreading into distant organs through the lymphatic and blood circulation and there establish new locations for growth ( see: http://www.online-medical-dictionary.org/). Cancer is thought to be caused by carcinogens, which are cancer promoting substances. These can be either physical carcinogens; such as X-rays and UV light, chemical carcinogens or viral carcinogens which disrupt the host genetic material . There are two main methods of treating cancer in developed countries today: radiotherapy and chemotherapy. Radiotherapy involves aiming a measured dose of ionising radiation at the tumour. The ideal is that the treatment should result in the removal of the tumour with as little damage to surrounding cells as possible The ionising radiation can be in the form of X-rays (other radiations are used) and its aim is to selectively damage the genetic information (DNA) of the tumour cells so they are unable to divide . late side effects which can occur months or even years after the treatment. An example of an acute side effect is alopecia, which usually occurs with radiotherapy to the brain. Most of the acute side effects are reversible within a few weeks to a month. Late side effects however are usually irreversible. Since large doses of radiotherapy are likely to cause late side effects, radiotherapy is given in several small doses . cardiac toxicity: poisoning of the heart tissue . Even though the current methods for treating cancer are effective, they are not without side-effects. How does the body defend itself against cancer? This section will give a brief overview of what goes on in the human body when a foreign agent enters it. There are many types of cell that are present in the blood whose job is to fight off disease and invaders in the body. These cells are collectively known as the immune system (Fig. 2). Fig. 2. 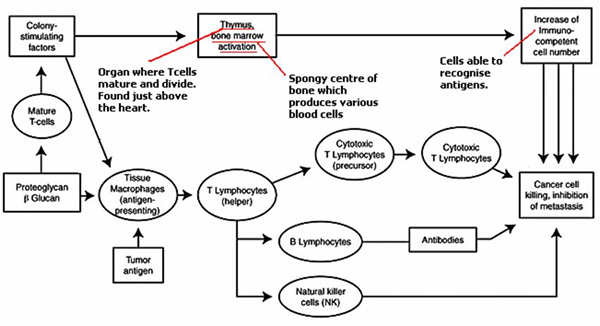 Diagrammatic summary of the operation of the vertebrate immune system. (Illustration taken from Martini, 2001 [reference 9]). T Cells. T cells become activated when an antigen binds to a glycoprotein. The specific glycoproteins involved are called major histocompatibility complexes (MHC) and are found on the membranes of cells. Fig. 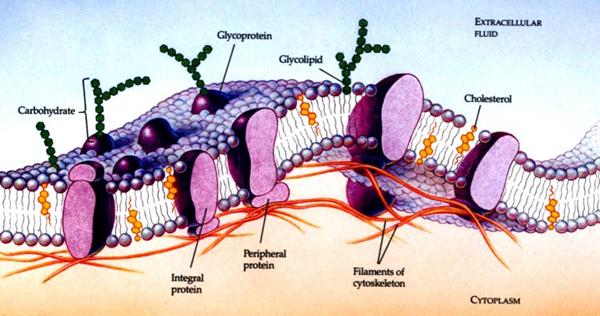 3 shows a diagram of a cell membrane; the membrane surface is shown in blue, with integral and glycoproteins embedded within the structure of the membrane, the carbohydrate chains of the latter extending into the extracellular fluid. There are two major classes of MHC proteins; Class I and Class II MHC proteins. Class II MHC proteins are found in the cell membrane of antigen-presenting cells, which activate T cells. Examples of antigen-presenting cells are fixed and free macrophages. These cells will be processing antigens such as viruses and bacteria. 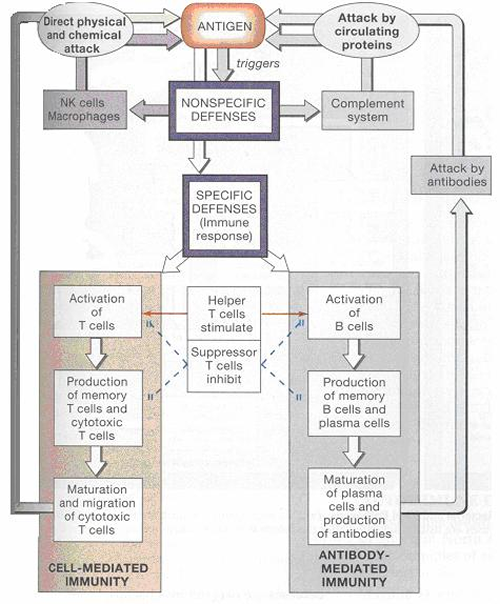 T cells have receptors which bind specifically to antigen-presenting cells. Once this has happened the T cell divides producing more T cells and memory T cells. Memory T cells act if the same antigen enters the body, so this time it can produce the specific T cell again rapidly to fight off the antigen. suppressor T cells, these secrete suppression factor, which effectively tell T and B cells to stop what they are doing, bringing a close to the immune response. antibody production, cytokines will release these antibodies which have the same target as sensitised B cell, this all happens to increase the immune response. Natural Killer Cells. These are also a type of lymphocyte that kill foreign cells (i.e. not belonging to the organism), virus infected cells and cancer cells. Cancer cells show tumour-specific antigens on their cell membrane, Natural Killer (NK) cells recognise them and then destroy the cell. Cancers develop when the cancerous cells do not show the tumour-specific antigen or it is hidden in some way. These cells are said to undergo immunological escape. Interleukins: as with all hormones, interleukins are chemical messengers. Interleukins increase the T cell’s ‘awareness’ of antigens on the macrophage cell membrane. They stimulate the activity of B cells and hence antibody production. They also act similarly to the suppressor T cells, telling the system when to ‘stop’. There are many types of interleukin, two of the most important being- IL-1 and IL-2. Interferons: make the cell and the surrounding cells that secrete them resistant to viral infections. They also have other benefits such as stimulating NK cells, and so are useful in fighting cancer. Tumour Necrosis Factor: this is secreted by activated macrophages and functions to slow tumour growth and kill tumour cells. It also increases T cell sensitivity to interleukins. Colony Stimulating Factor: produced by active T cells, stimulates the production of blood cells, T cells and B cells . Macrophages are white blood cells produced by the differentiation of monocytes; they can be anchored onto tissues in the body or free floating in the blood stream. Monocytes and macrophages are phagocytes, so they eliminate pathogens (and cellular debris) by either phagocytosis (engulfing and then digesting) or by releasing toxic chemicals such as tumour necrosis factor and nitric oxide. Macrophages function in non-specific defence (innate immunity) and also help initiate specific defence mechanisms (adaptive immunity). Macrophages can be identified by specific expression of a number of proteins including (e.g. CD14, CD11b, Lysozyme M, etc.). They are independently motile by amoeboid movement. Medicinal effects of mushrooms: how can mushrooms help prevent cancer? It must be noted that it isn’t the actual mushrooms, but the components of the mushroom that have the anti-cancer effects. The most relevant compounds, and the ones being examined in this report are polysaccharides. Polysaccharides are compounds that are branched or unbranched chains made of more than ten monosaccharides, linked by glycosidic bonds. Monosaccharides are simple sugars for example, glucose, mannose, galactose. Some examples of commonly-encountered polysaccharides are starch (the main plant food-storage polysaccharide), glycogen (the main animal and fungal food-storage polysaccharide) and cellulose the main structural component of plant cell walls) . 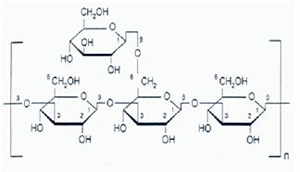 Polysaccharides are made when the monosaccharides undergo a condensation reaction (Fig. 4) to form long chains, which may be branched or unbranched . Fig. 4. Diagram showing how two monosaccharides combine through a condensation reaction in which a molecule of water is eliminated to creat the β1,4 bond. Illustration taken from reference 12. Several anti-tumour polysaccharides have been obtained from mushrooms. Polysaccharides are usually obtained from the cell wall of the fungus [10, 11]. In this report we will be looking at four in detail, Lentinan, Schizophyllan, PSK and PSP. These polysaccharides are the ones that have been considered the most important medicines and have undergone the most extensive clinical trials. These are all β-glucan polysaccharides, made up of glucopyranose units (Fig. 5). Although the exact mechanism(s) of action of these polysaccharides is/are unknown, what is known is the effect they have on the immune system. Fig. 5. Diagram showing a typical β-1,4-glucan polysaccharide illustrated at the location of a β-1,6 branch point. Illustration taken from reference 14. Both Lentinan and Schizophyllan are examples of pure β-D-glucans. The β-D-glucans are polysaccharides made from D-glucose monosaccharides. The exact effect they have on the tumour cells are unknown, except for the fact they act indirectly promoting the immune system rather than directly attacking the cancer cells. Since they act on the immune response of the host they are known as biological response modifiers (BRM); more specifically they are immunomodulators. BRM’s cause no harm or place any additional stress on the body, helping the body to adapt to the environment. All the polysaccharides discussed in this section can be described as BRM’s. Fig. 6 shows a flow diagram giving a summary of the effects β-glucan polysaccharides have on the immune system. Fig. 6. Likely effects of proteoglycans on the immune system. Flow chart modified from website: http://www.thorne.com/index.jsp [PDF]. Fig. 7. Illustrations of the fruit bodies of basidiomycete fungi from which the polysaccharides discussed here have been isolated. all these immune cells will play a part destroying tumour cells. eritadenine: this is a cholesterol reducing component and can be used to control cholesterol levels (considered important to control of heart disease) . RNA fractions; these are antiviral nucleic acids, which stimulate the cell to defend itself against viruses, making it more resistant. Lentinan produces a few adverse reaction, although none of them are serious. When combined with chemotherapy it can reduce many of the weakening effect such as nausea and lethargy. So not only does Lentinan have the potential to be used as an anti-cancer drug it can be used to treat other common medical problems. 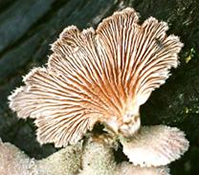 The compound Schizophyllan comes from the mushroom Schizophyllum commune, which is more commonly known as the split gill fungus, and is perhaps the world's most widespread macrofungus (Fig. 7). Schizophyllan is also a β-D-glucan, like Lentinan, and has already undergone several clinical trials in Japan and is approved for clinical use there. Schizophyllan has similar anti-cancer properties to Lentinan. Studies have also shown that Schizophyllan can prolong survival rate if combined with chemo- and radiotherapy. Another polysaccharide that has a similar effect is the Grifon-D compound from the Grifola frondosa mushroom, more commonly known as the Maitake mushroom; Fig. 8 shows the effects of combining Grifon-D with chemotherapy. Fig. 8. Effects of combining Grifon-D compound from the Grifola frondosa mushroom (commonly known as the Maitake mushroom) and chemotherapy. Patients took either oral Grifon-D plus crude Maitake powdered tablets, or Grifon-D plus placebo tablets in addition to chemotherapy. 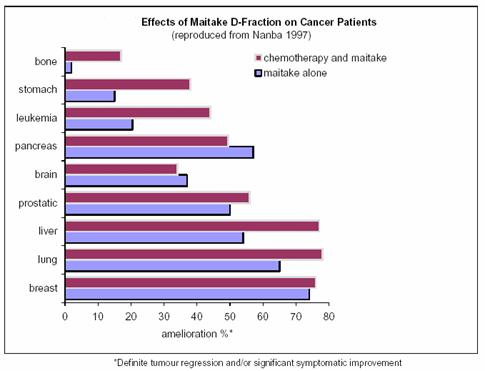 Tumour regression or significant symptomatic improvement were observed in 11 out of 15 advanced hepatocellular carcinomas with Grifon-D+Maitake; but when Grifon-D+Maitake was combined with conventional chemotherapy, the overall response rates were increased by 12-28% when results from all cancer types were combined. Data adapted from reference 1. 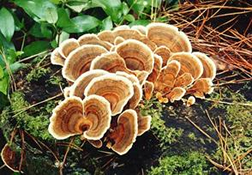 Both the compounds PSK and PSP come from the mushroom Trametes versicolor, which is more commonly known as the turkey tails fungus (Fig. 7). The PS in PSK represents polysaccharide and K represents the initial letter of the name of the company that first manufactured it (Kureha Chemical Industry Co. Ltd, Japan). The commercial name of the product is Krestin. PSP is an abbreviation of the name polysaccharide-peptide. The two compounds are chemically similar, in the sense that they are polysaccharides; however, the PSP polysaccharides contains arabinose and rhamnose, but no fucose, whereas the PSK polysaccharides do not contain arabinose or rhamnose, but do contain fucose. PSP has been shown to be active against many types of cancer but not all; it is most effective on cancers such as lung and stomach. These compounds do not offer a cure for cancer but they do appear to increase survival rates (Fig. 9). Fig. 9. 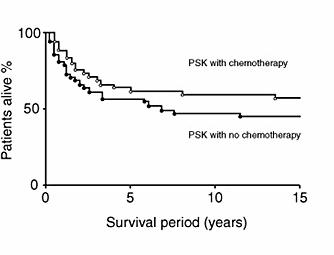 Clinically significant extension of survival by PSK, in stomach cancer (advanced, with invasion and metastasis) treated also using conventional chemotherapy and/or radiotherapy. Data from reference 14. Polysaccharides can be administered by intravenous injection. However, many can be taken orally (most commonly in tablet form). Oral administration is often preferred by patients since it is less invasive and is said to improve their quality of life. Tablets are less expensive than ready-to-use injections and this can be an advantage as the cost of drugs can become very expensive in long-term illnesses such as cancer. What are the benefits of using these compounds compared to traditional methods of treating cancer? These compounds don’t claim to cure cancer but increase survival rates and improve the quality of life of cancer patients. Some of the drugs, such as PSK are already used with chemotherapy treatment, this is known as chemoimmunotherapy. This has several benefits, most importantly it means that many patients such as the elderly and those with AIDs will not suffer from some of the weakening side-effects of chemotherapy (as discussed above). What is the potential of using these fungal components to treat cancer in the NHS? Western medicine seems rather unwilling to accept these medicinal mushrooms into clinical practice. This may be due the fact that until recently, there was not much information or data in journals to inform those in the medical profession of the benefits of fungal remedies. The compounds have been proved to increase survival rates and improve quality of life and it is hoped cancer specialists across the country will take into consideration the information provided in the Cancer Research UK report . Much of the current research done on these mushrooms has concentrated on the polysaccharides individually. However, as we have seen above, many of the mushrooms have multiple different positive effects on the body. Also it is possible that mixing polysaccharides from different mushrooms will have a stronger anti-cancer effect. The majority of the edible mushrooms on the market today are in fact very nutritional, containing a large amount of protein, carbohydrates, vitamins and minerals ; they may also be a cheap source of valuable medicines. “In Japan mushrooms are highly rated and recommended by doctors and nutritionists, together with green, vegetables to promote good health” . Perhaps the most telling survey was a study in Japan which showed that mushroom farm workers in the Nagano Prefecture in Japan had a lower death rate from cancer than other people from the prefecture (Table 2). The study suggested that the amount and how often the mushrooms were eaten were associated with a lower death rate from cancer for the mushroom farmers compared to the cancer death rate of people in the general population. Cancer death rate shown is rate per 100,000, age-adjusted through the years 1972-1986. Data from reference . The Cancer Research UK report  sets out strong evidence that the use of mushrooms has beneficial effects in the treatment of cancer and possibly other diseases. If the effective compound can be is administered orally it could prove to be a very effective and economic way of treating cancer. There is some debate over whether the British public will accept these methods of treatment. This is to be expected, since this is a new and untraditional method of treating cancer in the West. Herbal and fungal remedies have always been seen to be alternative medicine, it is important that these stereotypical views are broken if the effective Chinese remedies are to be seriously considered in the NHS. Penicillin, which is thought to be one of the most effective anti-bacterial drugs in the world in fact originated from a mould, Penicillium notatum. It was a wonder drug of the twentieth century that could almost immediately relieve some of the most common life threatening ailments (particularly septicaemia [blood poisoning]) that had afflicted humans for thousands of years, saving countless lives. The wonder drugs of the twenty-first century are the statins [16, 17], which are also the products of common mould fungi. The mushrooms discussed in this report have been used in Chinese medicine for several thousand years, without report of any serious side-effects. It is important more research and clinical trials are done on the effect of these polysaccharides because they show the potential of dramatically improving the quality of life of cancer patients; reducing side-effects of chemotherapy and radiotherapy and improving survival rates. Improving acceptability in western societies may be more a matter of improving western education so that it no longer ignores the entire Kingdom Fungi but gives due appreciation to our everyday dependence on the activities of fungi . 1. Smith, J.E., Rowan, N.J. & Sullivan, R. (2002). Medicinal Mushrooms: their therapeutic properties and current medical usage with special emphasis on cancer treatments. A report produced for Cancer Research UK. URL: http://sci.cancerresearchuk.org/labs/med_mush/med_mush.html. Chapter PDF. Complete PDF. 2. Moore, D., Robson, G.D. & Trinci, A.P.J. (2011). 21st Century Guidebook to Fungi. Cambridge, UK: Cambridge University Press. ISBN: 9780521186957. URL: http://www.cambridge.org/gb/knowledge/isbn/item6026594/?site_locale=en_GB. 3. Hawksworth, D.L. (2001). The magnitude of fungal diversity: the 1.5 million species estimate revisited. Mycological Research, 105: 1422-1432. DOI: http://dx.doi.org/10.1017/S0953756201004725. 4. Chang, S.-T. (2008). 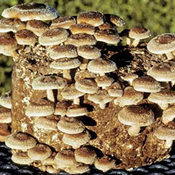 Overview of mushroom cultivation and utilisation as functional foods. In: Mushrooms as Functional Foods (ed. P.C.K. Cheung), pp. 1–33. Hoboken, NJ: Wiley. ISBN: 9780470054062. View on Amazon. 5. Eales, L.-J (2003). Immunology for life scientists, 2nd edn. Chichester: Wiley-Blackwell. ISBN-10: 9780470845240, ISBN-13: 978-0470845240. View on Amazon. 6. Miller, A.A. & Kearsley, J.H (1999). Radiobiology: its relevance to treatment. Chapter 7 in: Cancer Facts: A Concise Oncology Text (J.F. Bishop, ed. ), pp.35-41. London: Informa Health Care/Taylor & Francis Ltd. ISBN 10: 9057023652, ISBN 13: 9789057023651. View on Amazon. 7. Barton, M. (1999). Principles of radiobiology. Chapter 8 in: Cancer Facts: A Concise Oncology Text (J.F. Bishop, ed. ), pp. 42-46. London: Informa Health Care/Taylor & Francis Ltd. ISBN 10: 9057023652, ISBN 13: 9789057023651. View on Amazon. 8. Bishop J.F. (1999). Principles of chemotherapy. Chapter 9 in: Cancer Facts: A Concise Oncology Text (J.F. Bishop, ed), pp. 46-52 . London: Informa Health Care/Taylor & Francis Ltd. ISBN 10: 9057023652, ISBN 13: 9789057023651. View on Amazon. 9. Martini, F.H. (2001). Fundamentals of Anatomy & Physiology (Fifth Edition). New Jersey: Prentice Hall. SBN-10: 0130172928, ISBN-13: 978-0130172921. View on Amazon. 10. Wasser, S.P. & Weis, A.L. (1999). Therapeutic effects of substances occurring in higher basidiomycetes mushrooms: A modern perspective. Critical Reviews in Immunology, 19: 65-96. PDF. 11. Wasser S.P. (2000). Medicinal mushrooms as a source of antitumor and immunomodulating polysaccharides. Applied Microbiology and Biotechnology, 60: 258-274. DOI: http://dx.doi.org/10.1007/s00253-002-1076-7. 12. Hirst, K. (2000). AS Biology AQA (B): unit 1, module 1: Core Principles Unit Guide (Student Unit Guides). London: Philip Allan. ISBN-10: 0860034739, ISBN-13: 978-0860034735. View on Amazon. 13. Sugiyama, K., Akachi, T. & Yamakawa, A. (1995). Hypocholesterolemic action of eritadenine is mediated by a modification of hepatic phospholipid metabolism in rats. Journal of Nutrition, 125: 2134-2144. PDF: http://jn.nutrition.org/content/125/8/2134.full.pdf+html. 14. Kidd, P.M. (2000). The use of mushroom glucans and proteoglycans in cancer treatment. Alternative Medicine Review, 5: 4-27. PDF: http://ondax-scientific.com/pdf2/PMKMushroomRev5_1_61406.pdf. 15. Ingram, S. (2000). The real nutritional value of fungi. In: This website, Section 4.12. URL. 16. Gilson, M. (2000). Origin of drugs in current use: the story of statins. In: This website, Section 4.04. URL. 17. Pavey, C.-P.L. (2003). Origin of drugs in current use: more about statins.In: This website, Section 4.05. URL. 18. Moore, D., Robson, G.D. & Trinci, A.P.J. (2011). Mycology and the wider world. In: This website, Preface. URL. Organic matter: matter that has come from a once-living organism; fungal, plant or animal. Metabolism: the set of chemical reactions that happen in living organisms to maintain life. Stimulus: something external that influences an activity. Alopecia: a condition affecting humans, in which hair is lost from some or all areas of the body. Toxic: capable of causing injury or death, especially by chemical means; poisonous. Hormones: chemicals produced by glands in the body that circulate in the blood and control the actions of cells and organs. Cytotoxin: substance having a specific toxic effect on certain cells. Antigen: any substance capable of inducing a specific immune response and of reacting with the products of that response. Antibody: an immunoglobulin molecule that reacts with a specific antigen that induced its synthesis and with similar molecules. 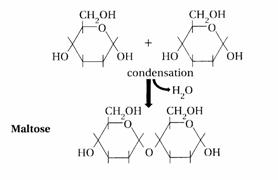 Condensation reaction: the process of combining two different molecules by eliminating a simple molecule like water. Apoptosis: a pattern of cell death affecting single cells, marked by shrinkage of the cell, condensation of chromatin, and fragmentation of the cell into membrane-bound bodies that are eliminated by phagocytosis. Often used synonymously with programmed cell death. Spore: a reproductive unit of some genera of fungi, protozoa or bacteria. Enzyme: a protein that catalyzes chemical reactions of other substances without itself being destroyed or altered upon completion of the reactions.